Any way you want it, the cork is on sale now. Flats from Marc by Marc at Saks, and pumps from Martin Margiela at eLuxury. 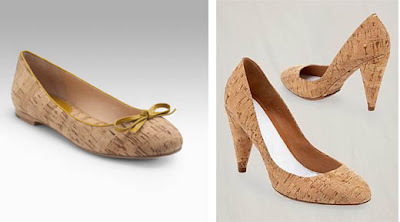 They are cute, weird, sorta eco-friendly and remind me of drinking wine; so it's like a drunken fiesta for your feet. I don't know where that came from, but I'm going to leave it in. Ha! Can you tell I'm aching for the weekend already? i just ordered the pumps. if i need to borrow money from you at all in the next couple months...you will know why. I'm concerned about the smell factor. Cork seems so...absorbent. I like how unexpected these are, though. Unexpected is getting harder and harder to accomplish. oh well damn. you learn something new every day. margiela... can do no wrong. we knew that already, though. it would be cool if they doubled as a wine dispenser. like just pop the heel off and wine would flow into a glass for you. then you could pop the heel back on...idk, i'll cork out the details and get back to you. cheers!